Any suggestion of boycotting the Eurovision, or boycotting Israel in any other way, betrays a catastrophic misunderstanding of the Israeli-Palestinian conflict. Sadly such a catastrophic misunderstanding is common. The first misunderstanding is the idea that Israel is basically at fault for the conflict. That Israel, somehow, is the "bad guy". The second misunderstanding is that Israel can do something to make the conflict better, and the West can pressurise Israel to do that. Neither of these ideas are true. The Arab-Israeli conflict began in 1947 with the violent rejection by the Arab Muslims of the former Ottoman Empire of the idea that a minority within Ottoman lands - the Jews - could set up their own state. This rejection was independent of what the territory of such a state would be. The original 1947 territory defined for Israel was majority Jewish, but the Arab rejectionists did not care. They rejected the very concept of a non-Muslim ("dhimmi") state within the historic lands of Islam. This rejection, in various re-brandings and re-wordings, has continued to this day, and is the fundamental cause of the conflict. Hamas expresses the rejection in pure form. Hamas does not want to just "liberate" Gaza and the West Bank. It wants to destroy Israel itself. The Hamas Deputy Minister of Religious Endowments says Jews are "foreign bacteria" and calls on Allah to "annihilate this filthy people ... They are not human beings." So much for Hamas. What is Israel? Israel is not a dictatorship like most of its neighbours. It is a liberal parliamentary democracy (free elections without a break since 1949). It is multicultural (18% Muslim, who all have votes and freedom of religion), liberal (the only gay pride in the Middle East, a thriving nightlife and free speech), pretty secular, and freer than all of its neighbours. If we do not defend countries like Israel against its non-democratic enemies, then what on earth do we stand for? The recent outbreak of hostility to Israel came after the Gaza fence riots. Some framed this as Israel shooting "peaceful protesters". It was no such thing. The riots were an attack by up to 50,000 people on the border, in order to break it down to storm into Israel and kill Jewish families in communities on the other side. A large percentage of those killed had military funerals from Hamas. If these jihadi fighters had been allowed break into Jewish communities, Jewish families would have been lynched in their homes. Some Irish compared the mobs to the Bloody Sunday protesters. But I do not recall the Northern Irish civil rights marchers chanting: "Allah Akbar! Oh Jews, we're coming to slaughter you!" - as the Gaza rioters did. Another comparison made by critics is to apartheid, especially on the West Bank. It is implied that there are simple solutions to the situation there. It is true that the situation in the West Bank is not ideal. In 1948, the West Bank was cleansed of Jews (that had lived there for thousands of years). In 1967, Israel defended itself against a threatened annihilation by the surrounding Arab states, and it occupied the West Bank as part of its self defence. Now 0.6 million Jews live in this "occupied" area, among 2.2 million Arabs. The situation is complex and unsatisfactory. Security is needed to keep Jews safe. It is not obvious where any border should be, or who should be citizens of Israel. Israel has resisted any final answer to these questions. Many Westerners seem to think the answer is simple - the area should be cleansed of Jews again, like it was in 1948. The 0.6 million Jews should be removed, and this will achieve something or other. Of course, it would achieve nothing. The West Bank would become Jew-free, it would become a terror state like Gaza, and a base for war against Israel. The war would escalate, not end. The occupation of the West Bank is not ideal, but it is better than the alternatives. In the meantime, note that Palestinian GDP per capita was (in 1990 dollars) $1,790 in 1967, and $5,312 in 1999. That is, the "brutal" Israeli occupation made the "oppressed" Palestinians three times richer. The Israel conflict is not like Northern Ireland, or South Africa. It is more like South Korea versus North Korea - the struggle of a flawed but fundamentally decent country to survive in the face of existential threats from repellent totalitarians. 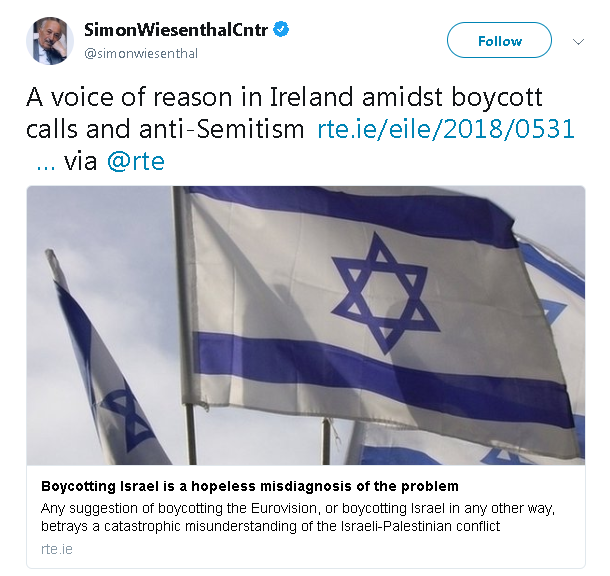 Ireland should stand in solidarity with Israel against its many jihadist, anti-semitic, supremacist and terrorist enemies. The idea of a "boycott" of Israel should be treated with contempt, as a hopeless misdiagnosis of the problem and the solution. Dr. Mark Humphrys is an academic in Computing at Dublin City University. His main current project is a tech startup. He has written since 9/11 on Israel and radical Islam, the two topics he believes people most misunderstand. In 2014, he visited Israel and met senior IDF officials, IDF border guards at Gaza, and civilians who live on the border under attack from Hamas rockets. He writes an occasional column in the Sunday Times. 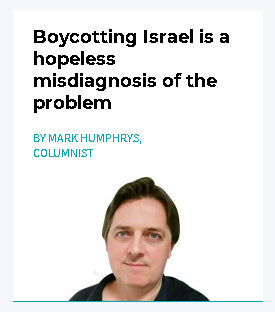 This was published on the RTE site (with minor editing) as: Boycotting Israel is a hopeless misdiagnosis of the problem, Mark Humphrys, RTE opinion, 1 June 2018. 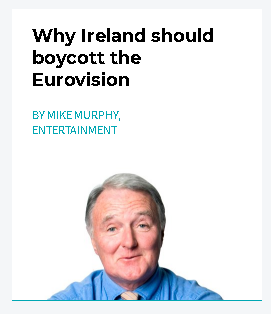 It was framed as a counterpoint to a pro-boycott article: Why Ireland should boycott the Eurovision, by Mike Murphy, RTE opinion, 1 June 2018. He suggests the jihadi mobs of Gaza should be allowed "return" to communities in Israel where their ancestors once lived: "Gaza is ready to explode - overcrowded, seething in resentment against the partisan policies of Israel, and despairing of any prospect of a return to the lands from which they have been dispossessed." Duh, yeah. There is no prospect of a return. So stop attacking Israel, leave Israel alone, and build a state in Gaza, you morons. Murphy says the young jihadis are angry because: "These seventeen-year-olds have seen their grandparents ripped forcibly from their homes and lands and left to die in a refugee camp". He is talking about things that happened in the 1940s! What kind of idiot refuses to get on and build a life for themselves because of things that happened to their grandparents? And what kind of Westerner panders to such self-destructive behaviour? On the RTE site as at 2 June 2018. Nice endorsement from the Simon Wiesenthal Center. 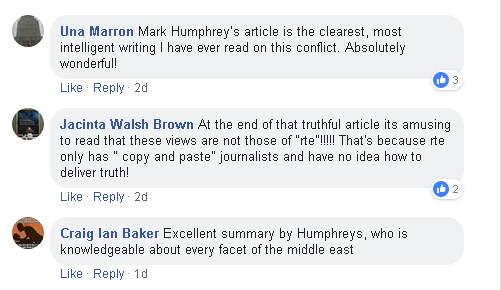 More love from comments on Ireland Israel Alliance post. There are plenty of rational people in Ireland.